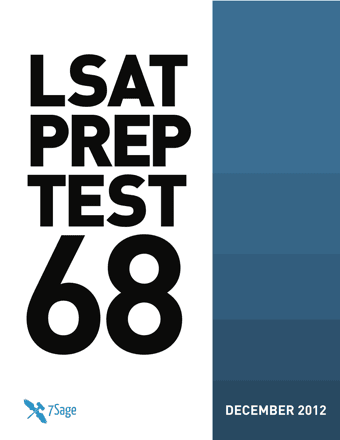 I just took PrepTest 68 (the December 2012 LSAT) under simulated testing conditions. I want to share some of my thoughts with you. This post will cover Logic Games for which I have already made the videos lessons (links below). Game 1 - A realtor is showing a prospective buyer seven houses. The first and second houses are shown in the morning. The third, fourth, and fifth are shown in the afternoon. The fifth and sixth are shown in the evening. Game 2 - Five witnesses are scheduled to testify at a hearing. The hearing is scheduled on Monday, Tuesday, and Wednesday. Game 3 - A maintenance company is taking service requests. Their clients are Image, Solide, and Truvest. For each client, there are two service targets - one for website requests and one for voicemail requests. The service targets are set for either 3 days, 2 days, or 1 day. Game 4 - An editor will edit seven articles. Three articles cover finance, three cover nutrition and one covers wildlife. The first and second games are standard sequencing and grouping games where much of the board can be determined. I made a few sub-game boards to better visually represent the placement of items on the game board. Both games were solved in about 5 minutes each with no errors. Since the first two games were quick, I expected the third and fourth games to be harder. The LSAT did not disappoint. The third one was confusing. I had to read the stimulus a couple of times to figure out how to set up the game board correctly. The stimulus used a lot of referential phrasing ("clients" and "service targets") that made the it hard to follow. The first rule took about 4 or 5 re-readings to sink in. I thought pretty hard about what it meant for "website targets to be not longer than voicemail targets." As is almost always the case, the time invested up front was worth it. I split up the game board into a few sub-game boards. Even with the sub-game boards drawn out, I still had to redraw them next to most of the questions to avoid careless confusion. This game took about 10 minutes with no errors. Going into the fourth game with about 15 minutes on the clock was comfortable. Still, I wasn't fully prepared for how difficult it would end up being. After setting up the game board and writing down the rules, I stared at the nearly blank page for a couple of seconds. I was pretty sure there would be no point in trying to spilt the main game board up into sub-game boards. The rules were so open that I couldn't make any inferences and so I didn't know where to start. But with plenty of time left on the clock I just hit the questions hard and thought I would brute force my way through them. That was risky. Most of the questions required a separate game board setup for each answer choice. That meant creating making up to 5 game boards for each question! That felt paralyzing. But you just do it. By the time I got to the last 2 questions, I was down to 2 minutes. Brute force is a highly time consuming strategy. For the second to last question, after spending about a minute on it, I eliminated the answers down to two. I had a strong feeling about one of them and just chose it so I could move onto the last question. I didn't prove it out. I just moved onto the last question. I got lucky and got it right. With under a minute left for the last question, I looked at answers and guessed at which one of the five probably was right given what I knew about the dynamics of the rules. Before I could even prove my only guess at the correct answer, time ran out so I had to bubble in my choice. I got lucky again. So, what's the take away? Two of these four games were hard. You have to be able to move through the easy ones very quickly to save up enough time to tackle the hard ones.